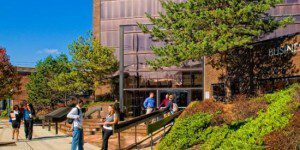 The flexible Rutgers Online MBA degree begins in the spring, summer, or fall and can be taken either part-time or full-time. The full-time curriculum typically takes two years to complete, while the part-time usually takes three. Enrolled students have the opportunity to specialize in four different career focuses: data analytics; digital marketing; investment and private wealth management; and strategic leadership. The 54 credit program consists of three foundational courses, 11 core courses, and three elective courses. Students in the program are usually around 33-years old and have at least 11 years of professional work experience. The entire RSBC Online MBA class consists of at least 250 students, around 45 percent of which are female. Tuition for the Rutgers Camden Online MBA is currently $1,256 per credit, which does not include an additional $300 online course fee. Over 54 credits the total tuition is $67,824. Additional fees apply to all tuition rates. Admitted students are eligible for a number of merit-based scholarships, based on academic record and GMAT scores. The school reports that several full-time students also work on a part-time, hourly basis for faculty members, although RSBC does not offer formal research assistantships. Enrolled students may complete the FASFA in order to apply for federal and private loans. International students are advised to seek private loan opportunities or inquire about aid opportunities with their local government. Applicants to the Rutgers University-Camden Online MBA program are required to submit the following: the online application form, a $70 application fee, original undergraduate and graduate transcripts if applicable, two letters of recommendation, a personal statement of the applicant’s career objectives, GRE or GMAT scores, and a current résumé. Applicants who hold a graduate degree, such as a JD, MD, or Ph.D., are not required to send their standardized test scores to Rutgers. In addition to these materials, international applicants must submit their TOEFL, IELTS or PTE scores and a statement of financial documentation. Indian applicants should note that the RSBC admissions committee considers Division I or II bachelor’s degrees, earned in three years at “A” grade, NAAC-accredited college in India to be equivalent to a four-year degree. International applicants for the Online MBA must follow the same standards, along with submission of reputable TOEFL, IELTS, or PTE scores and a statement of financial documentation.